I love this little secret. On the North Reef of Marsa Shagra, at about 35 metres on the second drop-off, there is a cave with a rocky outcrop in front of it. This red anemone is on top of the outcrop, cave side. 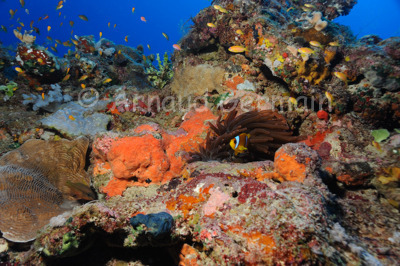 At this depth on this drop-off, life is really limited to a bit of soft coral but on this rocky outcrop, you can find a red anemone with its resident clownfish. I have also spotted up to 3 species of cleaner shrimps near the anemone and got a manicure for my trouble! Nikon D700, Nikon 28-105 mm macro at 28mm, F9, 1/60th, ISO 400, Ikelite Housing and Ikelite DS160 strobe set on TTL. Marsa Shagra North House reef cave on the second drop off, 35 metres down, Marsa Alam, Egypt.